What do quaint seaside villages, great seafood, picture-perfect medieval towns, stone age monuments dotting the landscape, crepes, galettes and hundreds of kilometers of car-free cycling paths have in common? They are just a few of the special treats to be enjoyed on a cycling holiday in Brittany! Whether you go for a week or a weekend, whether you go alone, with friends or with your family, whether you bike a little or a lot, Brittany is a virtual playground for exploring France by bike. Biking along this itinerary is effortless. The route is well-marked in both directions, and distances to towns and villages off the route are noted. With the exception of access in and out of the major towns of Dinan, Dinard and Saint-Malo, it is virtually impossible to get lost. Totally car-free for almost 100 km. you are free to relax and enjoy being surrounded by the gorgeous French countryside. Take deviations to canal-side villages for a late morning cappuccino, to the local supermarket for picnic supplies for lunch, or to the local cafe for an afternoon ice cream and beer. This route is made for slow travel and soaking up the Brittany landscape. 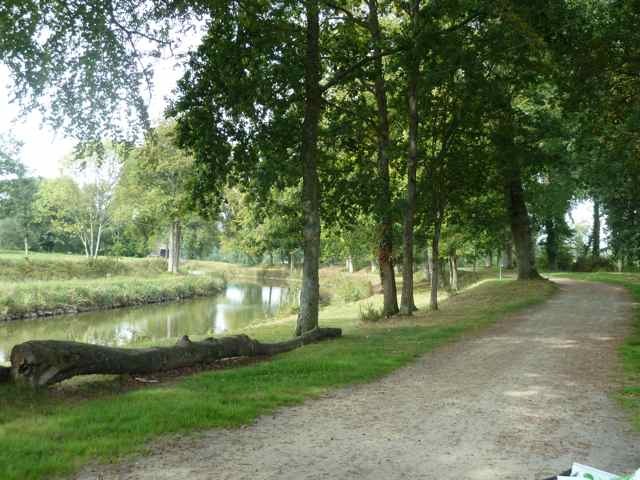 This flat gravel and packed-gravel cycle path follows the scenic River Rance and the Ille et Vilaine canal, started in the 1800’s by Napoleon. 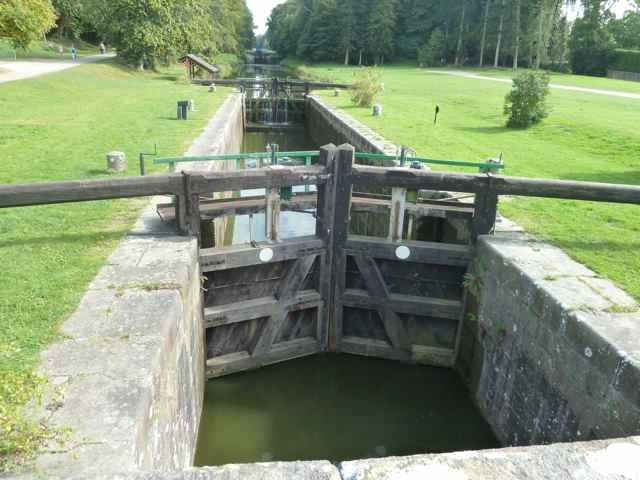 Ride along the towpaths where Napoleon’s soldiers oversaw construction of this engineering marvel with 48 locks. The route is dotted with picnic areas, lock keeper houses, pleasure boats cruising the river, fairy tale villages, chateaux off on the horizen and medieval churches. This itinerary is perfect for experiencing French history. At just under 100 km, the itinerary is short enough to do on a long weekend, but there are many deviations, especially along the coast, if you have longer. This greenway offers a sampling of Brittany’s best: from the art and history-packed town of Rennes, to Dinan, the best preserved medieval town in Brittany, to the 2,000 year old citadel town of Saint-Malo, this bicycling itinerary is an opportunity to see the region in a way you would never experience in a car. One of the most amazing parts of the trip along the D’Ille et Rance Canal is watching the locks in action. Watching pleasure boats approach a lock, prepare to enter the lock, get raised or lowered, and then leave the lock is an amazing and time consuming process. Any romantic ideas I may have previously had for pleasure cruising down a French canal were wiped away after watching the tedious, and oftentimes very physical process of navigating the locks. Nothing however, prepared me for the site of the locks near the village of Hede, the highest point along the canal. It is here, at Bazouges-sous-Hede that you are treated to one of the most amazing sites on the entire route: a “staircase of water” where a series of 11 locks 200 meters apart take boats through a 27 meter change in water level. Figuring that the average time it takes for a pleasure boat to go through one lock is between 15-20 minutes, it would take between 3 1/2 to 4 hours to navigate through the 11 locks near Hede. Amazing! Even more amazing was that conversations with locals validated that the awesome sight of the lock progression at Hede never goes away. The Maison du Canal is located next to the canal and is worth a short stop to learn more about the history of the canal and its importance to Brittany’s commerce in the 19th century. 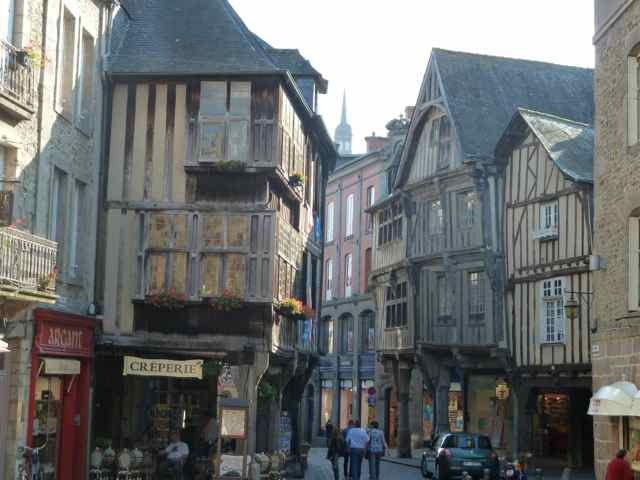 If there’s one town that I would go out of my way to visit in Brittany, it’s Dinan. Even viewing it by bike from below, knowing that it is a steep 300 meter uphill ride, you can feel the magic of this medieval town. Surrounded by nearly two miles of walls and a gorgeous port, this town is literally oozing with history, culture and charm. 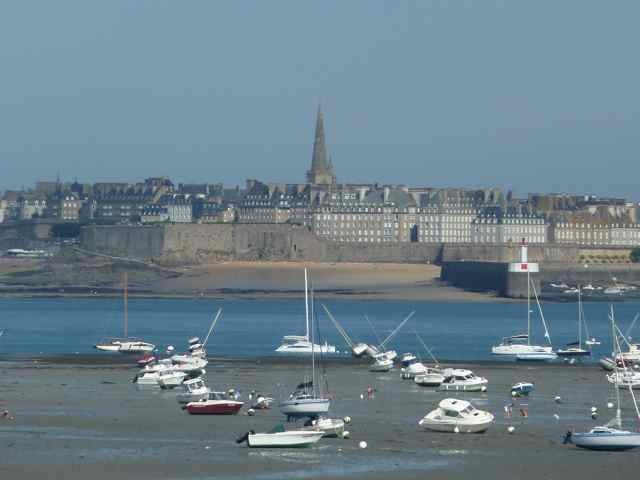 Many tourists bypass Dinan, visiting instead the much larger and commercial city of Saint-Malo. Big mistake. Bypassing Dinan would mean missing a real Brittany gem. Visiting Dinan is a trip back in time: a maze of cobblestone streets and old medieval timbered buildings surrounded by walls built by the Dukes of Brittany beginning in the 13th century. Walking the ramparts is the best way to appreciate the breadth of the fortifications, which include 12 towers, a keep and four monumental gateways and it takes a half a day to go completely around! 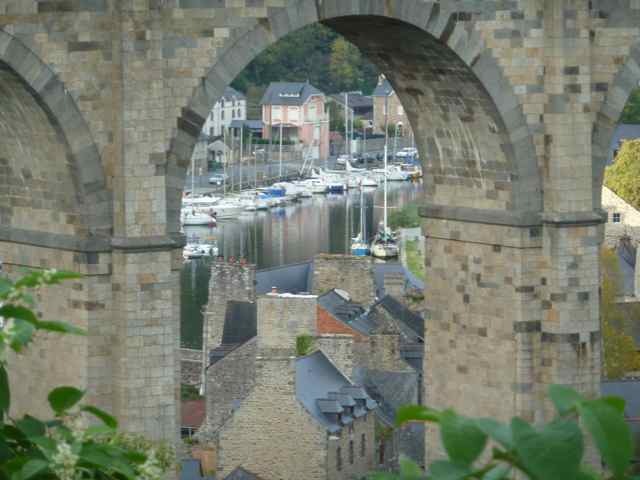 Dinan is a town to be savored: walking the ramparts and back alley ways, climbing the 158 steps to the top of the Clock Tower, having a picnic lunch along the port, watching boats go by. Life is slow here, and it’s the perfect place to sit back and enjoy France. From the mouth-watering Breton carmel-coated butter cakes called Kouign Aman, to crepes and galettes, to moules prepared in any fashion, to any type of seafood and lamb prepared more ways than I could ever imagine, the food in this part of Brittany is spectacular. From a croissant for less than a half a Euro, to a three course chef’s special for as little as 10 Euro, food choices along this route are plentiful and extremely affordable. And although Brittany is not known for its wine, residents certainly love drinking it, so it is always possible to find excellent bottles for 5 Euro or less. Obviously in larger towns like Rennes and Saint-Malo, there are more expensive options, but we always opted for small, local restaurants where a dinner rarely cost more than 20-25 Euros for two, including wine. We enjoyed a second cappuccino daily, along with the best looking pastry of the day, and never paid more than 5 Euros for 2 drinks and a pastry. Our favorite lunches were from local supermarkets along the route and our best choice was a container of home made beef bourgoguignon for 3 Euros. 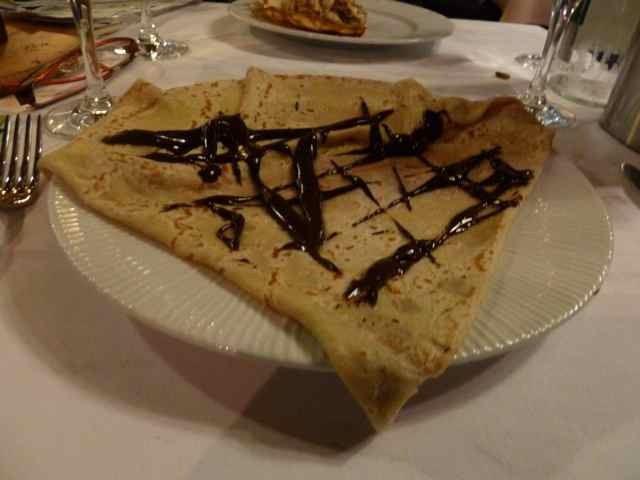 Our favorite dinner of the trip was at the creperie La Saint Georges on rue du Chapitre in Rennes. The Georgio Armani dinner crepe with potato, duck and flower salt is beyond description! This itinerary is easily accessed from the UK and Ireland, as well as from Paris. Rennes, Saint-Malo and Dinan are the best starting points for this itinerary if you are traveling by train from Paris, and they also offer the best bicycle rental options if needed. All have both TGV and regional express connections, in case you are traveling with your own bike. Rennes, Saint-Malo and Dinan are all easily accessible to each other via train, thus making it very easy to return to your origination point, should it be needed to return a bike rental. In the event that you are able to extend your trip adding on an excursion to Mont-Saint-Michel, Rennes, Saint-Malo and Dinan are all easily accessible to Dol-de-Bretagne in less than 30 minutes, or to Pontorson with a change in trains at Dol. From Rennes to Montreuil-sur-Ille there is local train service, thus making it easy to shorten the distance from Rennes to Dinan if you are short on time. If you are interested in reading more about cycling the Ille et Rance Canal in Brittany, you can read several blog posts that I wrote after my trip at Experience France by Bike. You can also access trip planning resources in Part II of the series. If you are biking on dirt or packed dirt/gravel trails use an all-terrain bike or a mountain bike, regardless of what a rental agency says. And if you are thinking about bringing your road bike, don’t. In the spring and fall, the paths are full of flower seeds, nuts, and other kinds of debris which makes it very easy to lose control, especially on skinny tires. If it rains, the paths get muddy and it’s important to have tires that can hold their own. Traveling by bike on packed dirt/gravel paths is much slower than biking on concrete or asphalt roads. Don’t think that you will cover the same distance on dirt paths…..that could make for a very ugly day. Whether you bring your own bike or rent a bike, make sure that you have emergency tire supplies: extra tubes, bike pump, tire patches, etc. Biking on dirt/gravel trails is much harder on your tires, and you don’t want to get caught in the middle of nowhere without the supplies you need. Here are my suggestions for an emergency bike kit . Despite what everyone says, always double check ferry schedules to make sure that there have not been any last minute changes that may affect your bicycle travel. We planned to take the 10 minute ferry from Dinard to Saint-Malo, only to find out that the ferry stopped running the day we planned on taking it. Our only alternative was a 2 hour deviation involving a lot of hills on a very hot day! Maggie LaCoste is the founder of Experience France by Bike, the Insider’s Guide to Biking in France. When she’s not exploring new bike routes in France, she’s busy writing about the best and newest itineraries. Maggie is also preparing to publish the first in a series of e-itineraries for weekend and week-long bike trips to France. To stay up to date on her latest project, follow her blog or follow her on Facebook. I have recently made the decision that the 2013 Annual Trip to Europe (from the US) will be a cycling tour of Provence. I am glad the London Cyclist has helped me discover your (very helpful) website! I’m so happy that you enjoy my website! I haven’t done that much cycling in Provence in the last 5 years as there are not many car-free bike paths in the region, it has a tendency to be quite hilly and very crowded and expensive in the summer and early fall. I hope that you have a fun time planning your trip and please let me know if there is anything I can do to help in your planning! I’ve done two cycling tours in France, on behalf of Macmillan Cancer Support, and can endorse Maggie’s views. Cycling in France is enjoyable, easy and respected – when a French driver hoots at you he is generally saying either Bonjour or Merci, not marking you down for destruction like so many English drivers. Roads and cycle paths are generally in much better condition than here in England, people especially in towns are friendlier towards lycra-clad, middle-aged, overweight, slightly ludicrous-looking tourists. The only similarity to cycling in England? French cyclists, like their English counterparts, are always willing to chat, help out with mechanical problems, and suggest great places to cycle! My favorite part of our cycling adventures is visiting with new French friends as well as new cycling friends from around the world. In the last 15 years, I think we have made friends on every continent, and you have to love spending the first few hours of every day with “Bonjour’s” at every bend in the road! Have cycling through Brittany and Normandy (plus other French cycling trips), and have enjoyed every minute. Why would you want to go to any other country – France is fantastic, and easy to get to from the UK via either ferry or train. A few words of caution. This type of carefree cycling relies on cafes and bars being open so you can stop for that mid morning coffee, that afternoon cidre. We cycled in Brittany in the first week of September . It was shut. Few cafes or bars were open in the days. It was a wet blustery week so no scope for picnics in comfort. I am so sorry that you had a bad experience in Brittany in early September. Actually we rode the Canal d’Ille et Rance the last week of September and found everything to be open, and the temperature was in the low 80’s! One of the challenges of cycling anywhere in England and northern France especially, is that you are totally a captive of the weather: warm weather is a blessing, cold and/or rainy weather is a curse. Overall, Brittany is always a gamble with over 200 days a year with some rainfall. Hopefully you will give it a go again! Thanks for the comments. I certainly had similar experiences early October. I agree that the cycling in this part of the world is fantastic and the greenways, which were well maintained and easy to navigate (once you’d found the start point if each one) were a major part of this. But I did find that, particularly in the smaller less touristy towns and villages, the probability of everything being shut increased dramatically. I had at least one evening meal consisting of a pack of mini crackers and an apple pulled from my panniers. Great blog – eight of us on four tandems did the St Malo – Dinan – Combourg – Mon St Michel route last August over the bank holiday weekend. Four days and a brilliant time – lovely countryside, quiet roads, great food, wine etc. All very do-able for some 50 somethings who are not over fit! Exactly, with great routes and lots of attractions, you can bike a little or a lot! We are always amazed at the European couples who we meet who are 70+ and still long-distance cycling! As I write on my blog, bicycling in Europe is all about the experience, not the distance! Hope you plan another trip to France! Before we had children, my wife and I spent all our summer holidays cycling in France. Although pasrt are of course mountainous a surprisingly large proportion is really quite flat and makes easy cycling terrain. You can cycle along the banks of various canals and rivers, for example, from north to south. The Loire Valley is good, with a long route with quiet riverside or valley lanes on flat land. Places like Saumur, Chinon, Fontevraud l’Abbaye (where Henry II of “Lion in Winter” fame died and is buried, alongside his wife Eleanor of Acquitaine and Richard Lionheart). Angers and Tours. Further up the valley are Cosne sur Loire, Pouilly sur Loire and Sancerre. The Rance canal towpath is also a beautiful region and I can vouch for the charm of the towns en route. France does not have the same network of off-road cycle paths you find in the Netherlands but it does have a huge network of quiet back roads and lanes, and even the main roads ar not so threatening as here, as drivers tend to be more careful and considerate – perhaps because they have strict liablity over there. There is an extensive network of “Routes Vertes” which are closed to motors, except perhaps for access. Only problem is that I have never had much success in finding any maps which show where they are. And of course France is just fabulous for family-owned restaurannts and auberges, small hotels known as Logis, and “Chambres d’Hote”. I recommend the Logis network – obviously it is not the cheapest solution but not outrageously expensive, fiendly and intimate, and you can ask one hotelier to ring ahead to make your next booking. 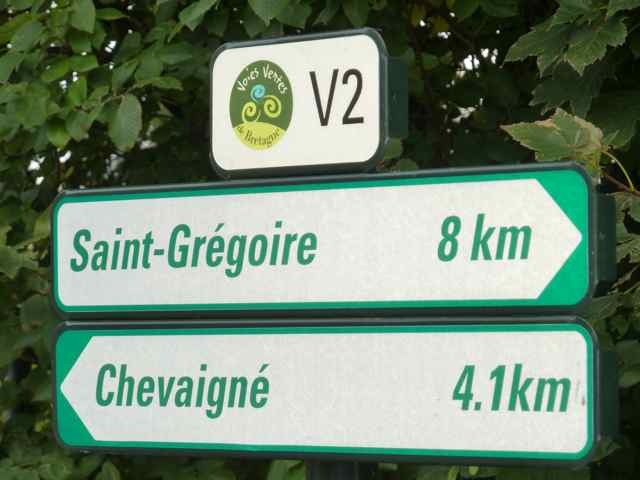 One of the reasons that I started Experience France by Bike is because it is so difficult for English speaking cyclists to find information on all of the new car-free or limited car traffic bike routes. We started to discover about 5 years ago that so many of the books on biking in France are seriously outdated, and many of the websites detailing the new generation of voie verte and veloroutes are in French. Experience France by Bike was created to be the “insider’s guide to biking the backroads of France”. All of the rides that are featured on my website http://www.experiencefrancebybike.com are safe enough for families with children, are perfect for even the most casual cyclist, are sign-posted in both directions, and have all the normal bike support services at regular intervals. If you are interested in more stories on biking in France, please come and visit, and recommend my site to your friends too! Met a cycling club in Normandy who were happy for me to ride 50 miles with them at 16mph pace(I do 18mph – 19.5mph at a push for 3 hours). They dropped me after 30 miles away from the start point and didn’t wait at all. A passing French cyclists said that was unusual. Luckily had a map, but took 3 hours to return due to frequent map checks. However, roads and countryside was great. l motorcycle all over France,The roads are great,but more importantly the French drivers are FAR better than the brits(l am a brit)on any sunday you will see loads of bikes in full tour de france gear even the old boys and they get repsect. ln cities like everywhere,it is not as safe,as like us thet are mad,but outside no probs.in fact for me the only prob is when you come back to the UK and you see how shite our drivers are. We used the train once – but most of the time cycled on the paths and on quiet French roads. We used ordinary hybrid bikes with two panniers each – but did find the paths heavy going in the rain in some places and we’re in our early 60’s! Just planning this year’s route when I fell off my bike in a Deptford park, due to skidding on excess gravel on the path and now have serious leg fractures. I cannot believe it and am very upset! Great article…I can echo many views on here of France’s approach towards cyclists having completed a London2Paris 24cycle. The roads are clean, well made and great for cycling. Motorists give you a wide berth so much so in fact they even risk themselves with oncoming traffic rather than risk the cyclist. Whenever they hoot their horns its encouragement (I guess cycling in a tight group and all wearing matching kits did help a little with this) but they are so much more accomodating towards cyclists. It’s a pleasure cycling in France rather than a challenge like it can be in the UK especially London. We will be cycling from Rennes this fall. Can you recommend a good hotel in Rennes with easy access to the tow path bike trail?